Do Halloween Candies Cause Cavities? Halloween is the time of year for ghosts, ghouls, and creatures of the night, but the most horrifying threat of all may be tooth decay. While Halloween candies can be a tasty treat for kids, they can also lead to cavities and other dental problems. However, that doesn’t mean you shouldn’t celebrate Halloween. Rather, by understanding how sweets damage our teeth and by following some basic tips, you can keep your kids from having to make a post-Halloween visit to the dentist. While many people know that sugar can cause cavities, few people know just how damaging it can be to our teeth. In fact, a recent study in BMC Public Health suggested that sugar is the cause of almost all tooth decay. Sugar can cause cavities and tooth decay in several different ways. When teeth are not cleaned properly, bacteria in the mouth begins to form plaque on the teeth; not only does plaque contribute to cavities, but it feeds on sugar. 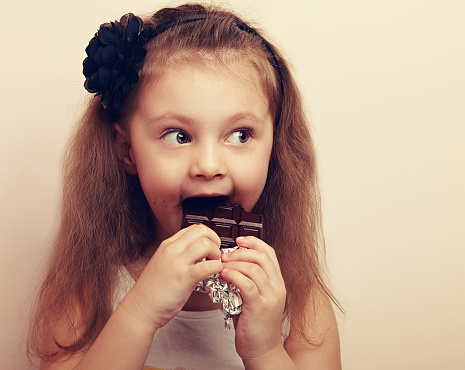 Candies and chocolate bars are the perfect food source to allow plaque to grow and cause cavities. In addition, plaque turns the sugar in your mouth into an acid that can wear down teeth and cause tooth decay. Sugary candies can also cause your teeth to become weaker. Eating sugar causes our blood sugar levels to increase, and in response, your body pulls minerals from your bones and teeth to combat the effects. Without key minerals, your teeth are more likely to develop tooth decay. Candies are known for being unhealthy, but their ingredients can be even worse than expected. There are many different types of sugar ingredients that can be found in candy, including sucrose, glucose, fructose, and high-fructose corn syrups. Just one chocolate bar can have the upper limit of sugar an adult should have for the entire day; this means that a kid munching away on lots of Halloween candies is eating an unhealthy amount of sugar. Some candies, like caramel candy, are almost entirely made out of sugar. All of this sugar can have a bad effect on the health of your teeth. Remove hard and chewy candies from your children’s loot: Caramel candies, lollipops, and toffees leave sugary residue in the mouth and get stuck in teeth easily compared to chocolate bars or gummies. Don’t allow your children to snack all day: Instead, limit them to enjoying their candy in one sitting so that they can brush their teeth afterwards. Spread candy out over a longer period: Halloween candies can usually last for the next month. Instead of your children eating sixty candies in one night, having one or two small pieces each day will prevent their teeth from being overloaded with sugar. Remember to keep properly caring for your children’s teeth: Make sure they brush and floss and schedule regular dental care appointments with your children’s dentist. Princeview Dental has been a fixture of the Kingsway area in Etobicoke for over 20 years, where we’ve provided dedicated family care in a professional, welcoming, and modern environment. For more information, please visit our web site.